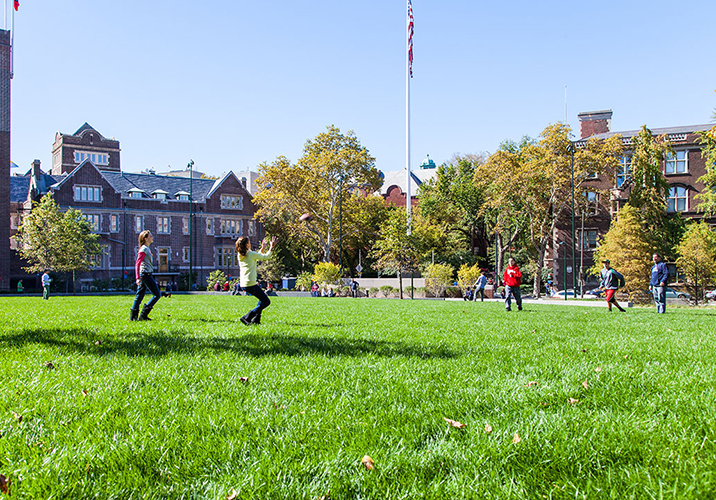 The University of Pennsylvania’s Shoemaker Green is a 2.75 acre space nestled between the iconic Franklin Field, The Palestra, and David Rittenhouse Laboratories. 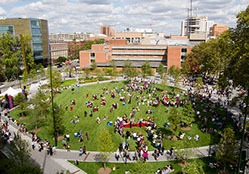 Construction of the site began in the fall of 2011 and opening day was celebrated on August 21, 2012. 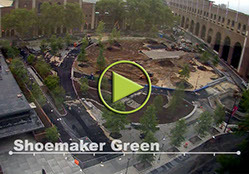 Consistent with Penn’s Climate Action Plan and President Amy Gutmann’s vision for a sustainable campus, Shoemaker Green increases campus green space, enhances pedestrian environments, improves stormwater management for the campus and the city, and creates a landscape that is functional and beautiful. 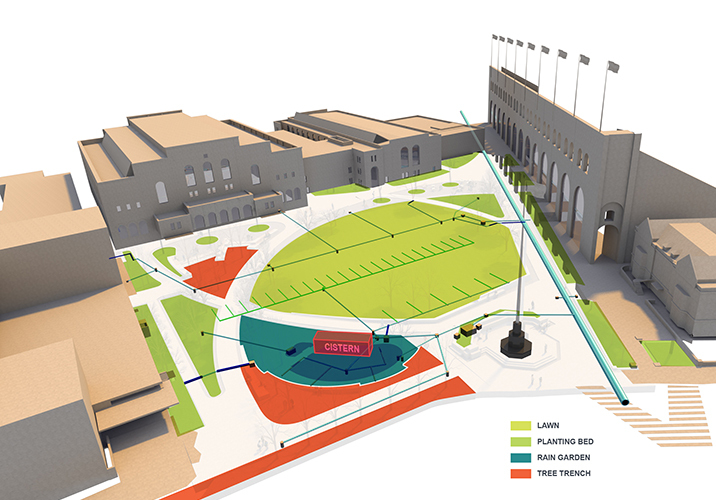 The site program includes primarily passive recreation, but has the flexibility to house events of multiple scales, from intimate gathering areas to staging areas for the Penn Relays and graduation. 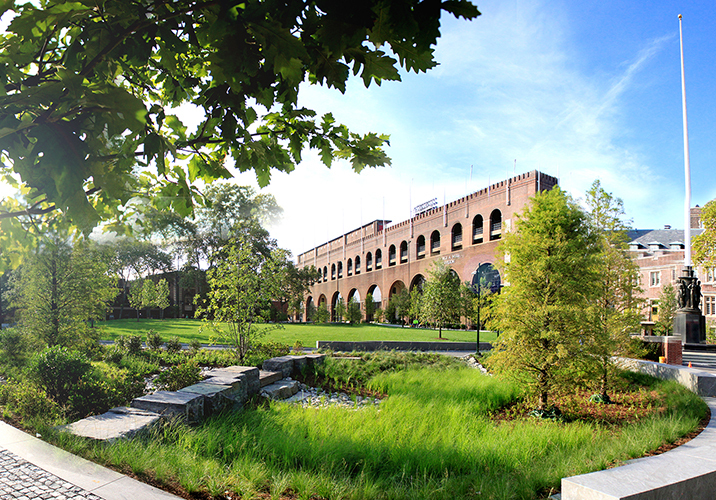 Chosen to be one of the Sustainable Sites Initiative’s (SITES™) Pilot Projects, Shoemaker Green is a model for sustainable campus design by incorporating innovative storm water strategies, creating native plant and animal habitats, and recycling existing site materials during construction. The layers of performance within this space include: a below ground sand storage bed for stormwater, a network of trench drains and pipes that convey the surface stormwater and roof runoff from adjacent buildings; porous hardscape surfaces that prevent overland sheet flow; a 20,000 gallon cistern and irrigation system that reuses stormwater and AC condensate; and vegetation that transpires water back into the atmosphere. The high performance landscape was designed to capture at a minimum the 1” water quality storm by recirculating stormwater and AC condensate between the 20,000 gallon system, irrigation system, and the soil and vegetation, which stores, evaporates and transpires the water with the hopes of preventing overflows to the combined sewer. 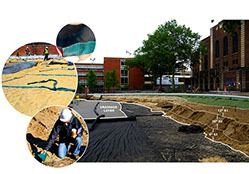 The largest stormwater BMP within the site is the 3ft deep lined soil matrix below the lawn area. These soils are a designed mix of coarse sand and sandy loam soils. As the soil becomes saturated, water is wicked away by Smart Drain TM channels to the irrigation system. The Smart Drain TM is a thin plastic strip comprised of tiny micro channels that wick water away through natural capillary action and are designed not to clog. 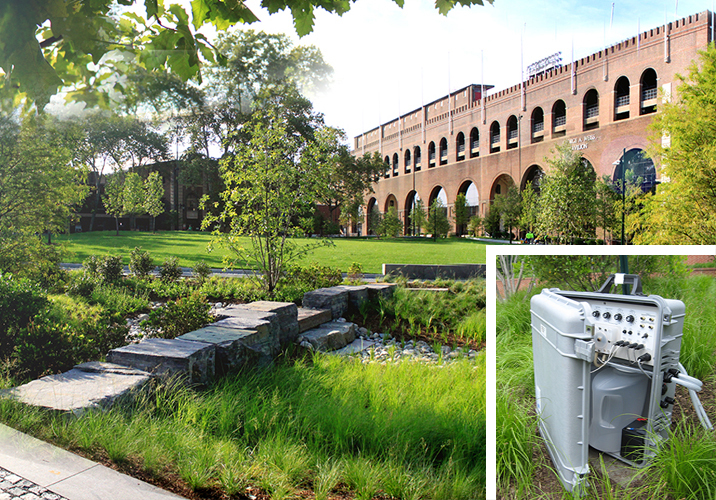 As part of the Sustainable Sites Initiative, Andropogon and the University of Pennsylvania have partnered to monitor the performance of the site BMP’s. The research team is monitoring water quantity; water quality; biological, physical and chemical attributes of the soil, evapotranspriration, and soil dimensions of the site as they relate to stormwater performance and environmental education. An automatic water sampler is used to test water quality in the rain garden during the “first flush. Soil compaction is also being monitored. This information is used not only to assess the impact of foot traffic on the stormwater performance of the soil over time, but also to guide soil management of the site if the compaction levels become high enough to effect plant health. Soil health is being monitored through both qualitative and quantitative soil biology assessments. Shown here are two beneficial soil organisms, a fugal hyphae strand and a nematode. The fungal hyphae are long, wide, and brown in color, all indications of a beneficial hyphae. The worm-like nematode has unique mouth parts that identify it as a beneficial soil organism. Behavior mapping and interviews are also being conducted at the site to learn how people use the space and how they learn from the site. The first round of data was completed by Alicia Coleman during the 2013-2014 seasons. 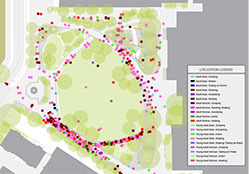 Some of her conclusions were as expected, such as the highest activity was concentrated along the walkway in front of Franklin Field. Other findings, such as indicators that a small amount of people are aware of the environmental benefits of the design, were not expected and are guiding future plans to embed more amenities to communicate the design intent. 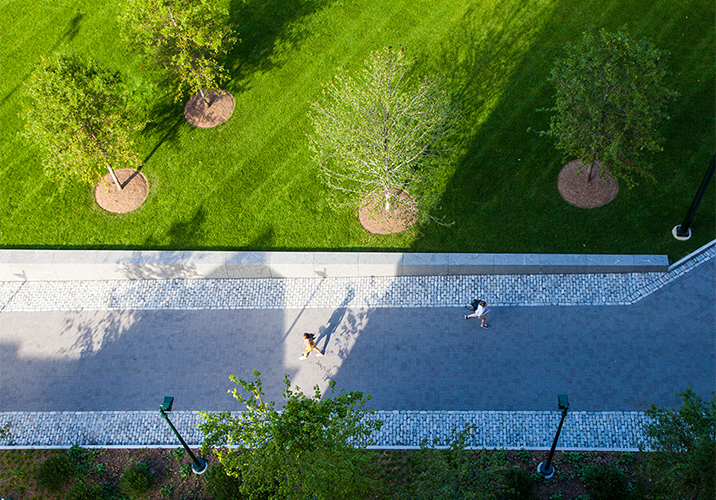 The planting design for the space is based on a community composition that might be found in the Mid Atlantic Coastal Plain Ecoregion, as the sand based soils designed for Shoemaker Green added to the appropriateness of this community for the design. 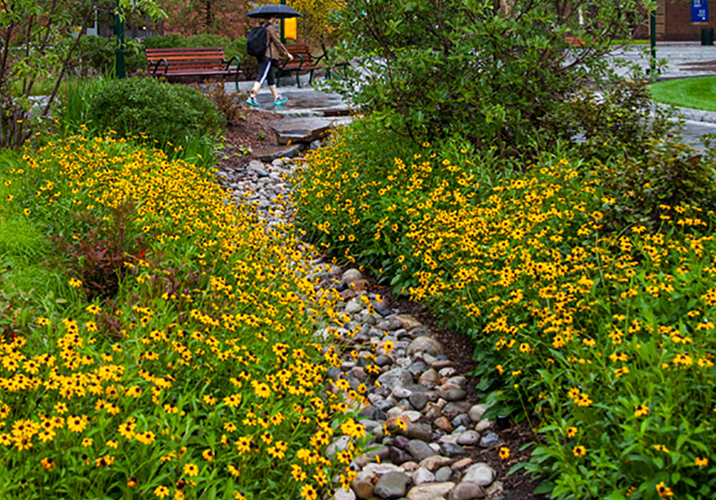 Although the entire site stores water, the rain garden is the only space on the site that allows for surface expression of water in large storm events. This increased saturation period required a planting palette that could withstand longer periods of inundation, Carex stricta, Iris versicolor, and Taxodium distichum are the three primary plants at the lowest elevation in the rain garden. 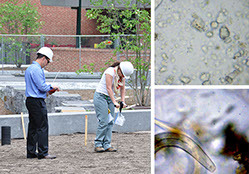 In the rain garden and throughout the site, transpiration rates of various vegetation types are being monitored. In the field, a leaf porometer is used to measure the stomatal conductance and a ceptometer is used to measure the photosynthetically active radiation and thus leaf area indices of each plant type. A series of conversions are done to determine the energy loss per tree or area. The energy loss equates to how often the leaf stomata opened, which can then be converted to gallons of water lost. So far the Quercus bicolor, Nyssa sylvatica and uncompacted turf are performing quite well. 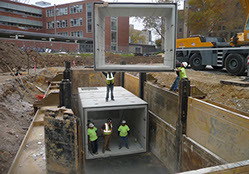 By monitoring stormwater flow using pressure transducers for each BMP, the research team has concluded that the site can treat up to a 3.14” storm, three times more than what the engineering models suggest it can treat. Despite this stellar performance, on 39 days from 2013-2015 the site overflowed to the combined sewer. This was attributed to a mismanaged irrigation system and reduced capacity during the winter months, when the cistern was offline. As Shoemaker green was approaching completion. We recorded a time-lapse video of the work up to a point. 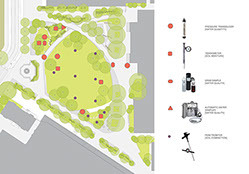 This research and adaptive management project with the University of Pennsylvania faculty, students, and facilities staff is a 5-year endeavor to understand the measureable contribution soils and plants have in stormwater management and how people perceive, learn from, and utilize the space. 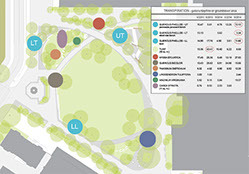 The data collected also informs sustainable management of the landscape and the entire campus.